I found a really great recipe for homemade pizza dough, so I thought I'd give it a shot. I don't know about you guys, but I really like knowing exactly what's going into my food. So, here it is! Easy, fresh, delicious. Knead the bread for about 10 minutes, or until it's all smooth and combined. Roll it into a smooth ball and brush olive oil all over it. 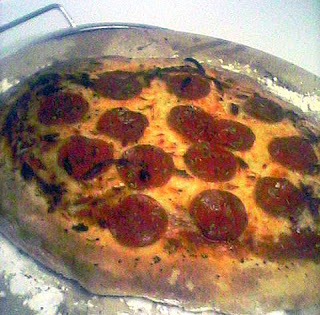 When you're actually ready to make the pizza, throw some flour on a counter and roll the ball of dough out until it's smooth and in the shape of pizza crust. Make sure the outsides are higher. You can do that by gathering the dough and pushing it towards the outside. Time for the fun part-toppings! I'm a simple girl. I added a bunch of mozzarella, pepperoni, a little Parmesan, and I sprinkled a few herbs on top: parsley, basil, and a little old fashioned Italian seasoning. Brush the crust part with a little olive oil-it'll make it golden and crunchy. That's it! The hardest part is the dough, and even that's not hard at all. Enjoy!